War is urbanising. No longer fought on beaches or battlefields, conflict has come to the doors of millions living in densely populated areas, killing thousands of civilians, destroying historic centres and devastating infrastructure for generations to come. Last year, the world watched the Middle East as Mosul, Raqqa, Sana’a and Aleppo were razed to the ground. 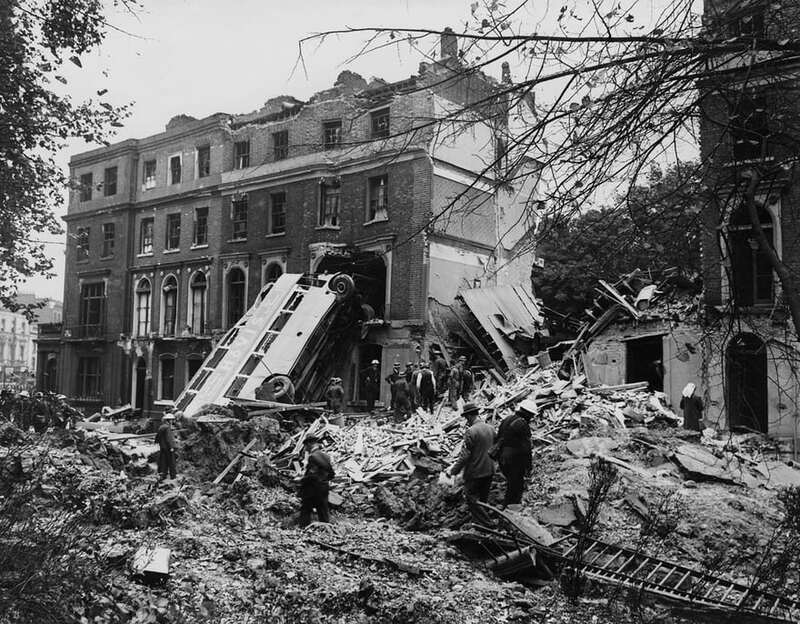 Across Europe, brutal attacks stunned urban populations in Paris, London and Berlin, while gang warfare tore apart the fabric of cities in central and south America. 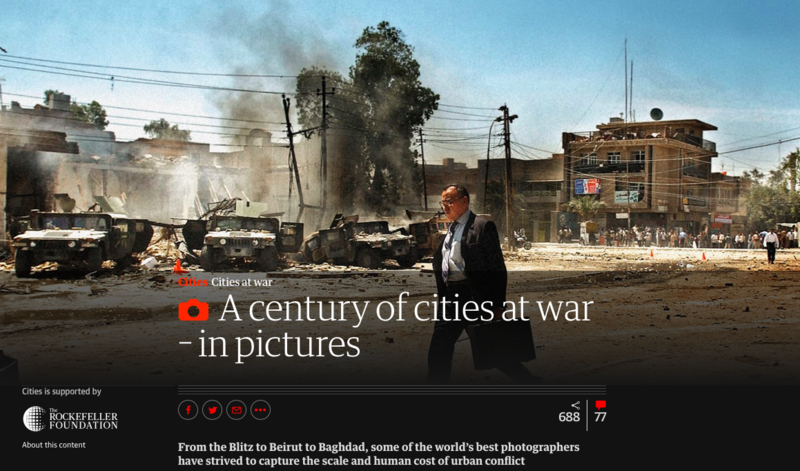 In 2018, Guardian Cities will explore the reality of war in cities today – not merely how it is fought, but how citizens struggle to adapt, and to rebuild stronger than ever. It’s an arresting portfolio, and inevitably selective: there is a good discussion below the line on what other cities should have made the cut. [I]t was around the time of the Paddington station attack [by Fenians in 1883] that the strategy of using violence to sway public opinion though fear became widespread among actors such as the anarchists, leftists and nationalists looking to bring about dramatic social and political change. This strategy depended on two developments which mark the modern age: democracy and communications. 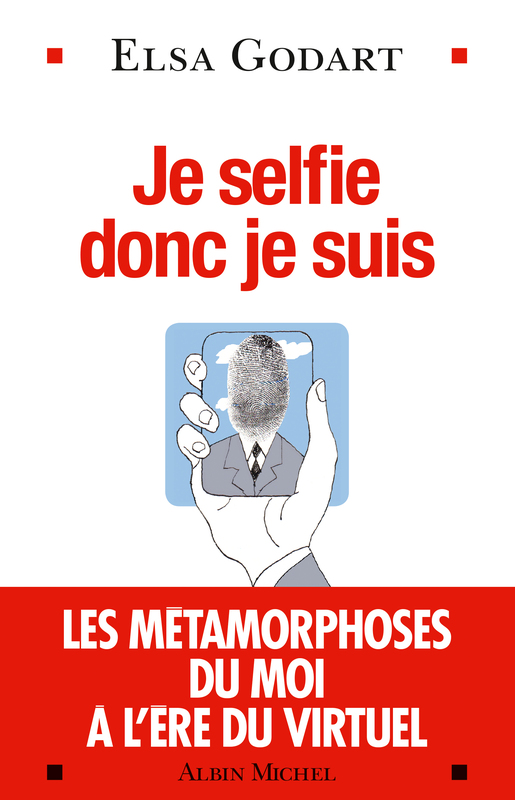 Without the media, developing apace through the 19th century as literacy rates soared and cheap news publications began to achieve mass circulations, impact would be small. Without democracy, there was no point in trying to frighten a population and thus influence policymakers. Absolutist rulers, like subsequent dictators, could simply ignore the pressure from the terrified masses. Of course, a third great development of this period was conditions in the modern city itself. Could the terrorism which is so terribly familiar to us today have evolved without the development of the metropolis as we now know it? This seems almost impossible to imagine. Even the terror of the French revolution – Le Terreur – which gives us the modern term terrorism, was most obvious in the centre of Paris where the guillotine sliced heads from a relatively small number of aristocrats in order to strike fear into a much larger number of people. The history of terrorism is thus the history of our cities. The history of our cities, at least over the last 150 years or so, is in part the history of terrorism. This is a deadly, inextricable link that is unlikely to be broken anytime soon. The traditional security paradigm in our western-style democracies fails to accommodate a key feature of today’s wars: when our major powers go to war, the enemies they now encounter are irregular combatants. Not troops, organised into armies; but “freedom” fighters, guerrillas, terrorists. Some are as easily grouped by common purpose as they are disbanded. Others engage in wars with no end in sight. What such irregular combatants tend to share is that they urbanise war. Cities are the space where they have a fighting chance, and where they can leave a mark likely to be picked up by the global media. 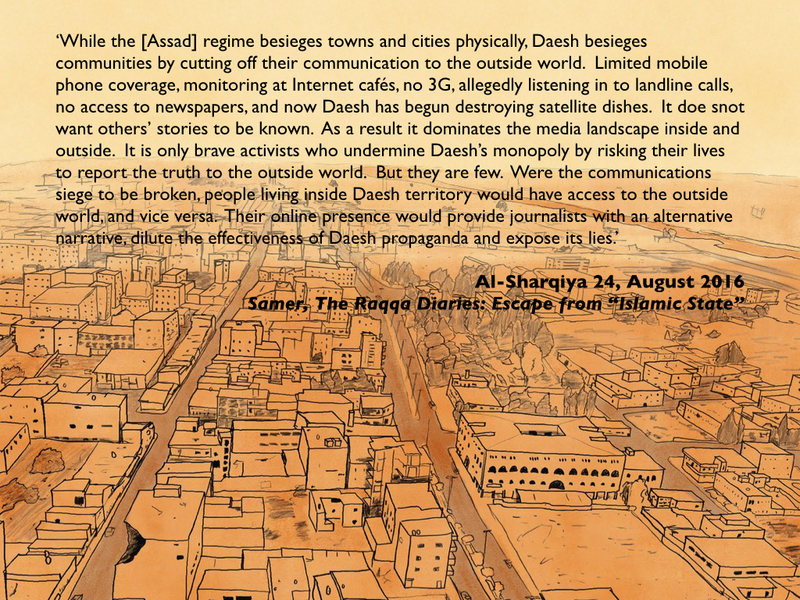 This is to the disadvantage of cities – but also to the typical military apparatus of today’s major powers. The main difference between today’s conflicts and the first and second world wars is the sharp misalignment between the war space of traditional militaries compared to that of irregular combatants. Irregular combatants are at their most effective in cities. They cannot easily shoot down planes, nor fight tanks in open fields. Instead, they draw the enemy into cities, and undermine the key advantage of today’s major powers, whose mechanised weapons are of little use in dense and narrow urban spaces. 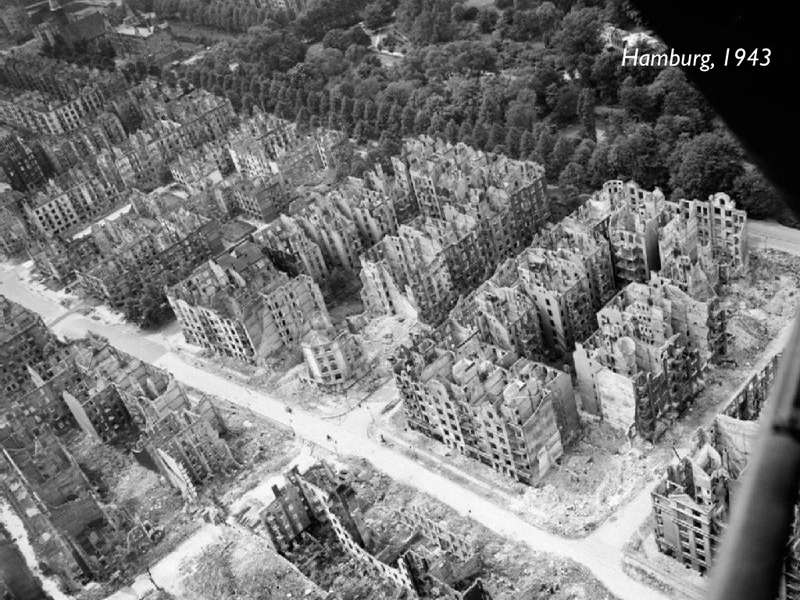 We have gone from wars commanded by hegemonic powers that sought control over sea, air, and land, to wars fought in cities – either inside the war zone, or enacted in cities far away. The space for action can involve “the war”, or simply specific local issues; each attack has its own grievances and aims, seeking global projection or not. Localised actions by local armed groups, mostly acting independently from other such groups, let alone from actors in the war zone – this fragmented isolation has become a new kind of multi-sited war. This is, in part, what I tried to capture in my early essay on ‘The everywhere war’, and I’m now busily re-thinking it for my new book. 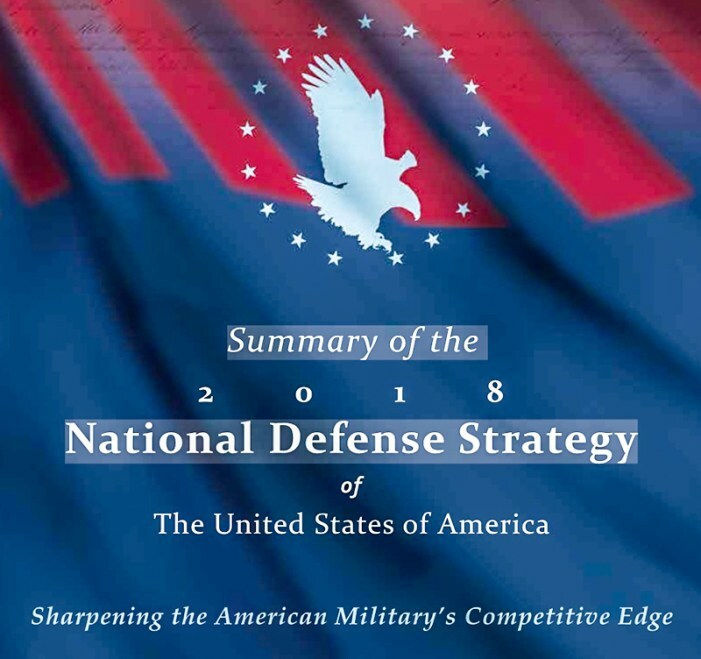 More on this in due course, but it’s worth noting that the Trump maladministration’s National Defense Strategy, while recognising the continuing importance of counter-terrorism and counterinsurgency, has returned the Pentagon’s sights to wars between major powers – notably China and Russia (see also here)– though it concedes that these may well be fought (indeed, are being fought) in part through unconventional means in digital domains. 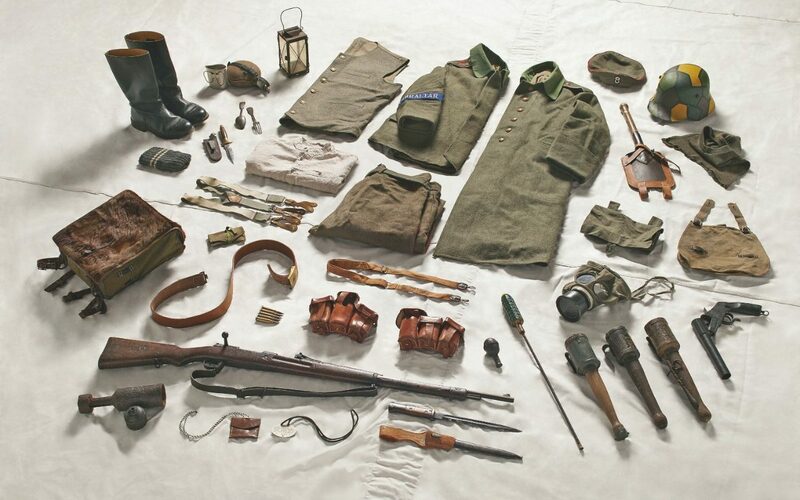 In short, I think later modern war is much more complex than Saskia acknowledges; it has many modalities (which is why I become endlessly frustrated at the critical preoccupation with drones to the exclusion of other vectors of military and paramilitary violence), and these co-exist with – or give a new inflection to – older modalities of violence (I’m thinking of the siege warfare waged by Israel against Gaza or Syria against its own people). 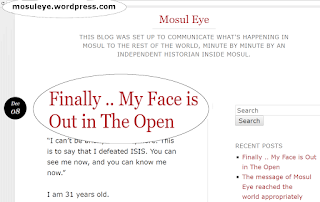 The two contributions I’ve singled out are both broad-brush essays, but Ghaith Abdul-Ahad has contributed a two-part essay on Mosul under Islamic State that is truly brilliant: Part I describes how IS ran the city (‘The Bureaucracy of Evil‘) and Part II how the people of Mosul resisted the reign of terror (‘The Fall‘). Like many other diwans (ministries) that Isis established in Mosul, as part of their broader effort to turn an insurgency into a fully functioning administrative state, the Diwan al-Siha (ministry of health) operated a two-tier system.There was one set of rules for “brothers” – those who gave allegiance to Isis – and another for the awam, or commoners. “We had two systems in the hospitals,” Wassan said. “IS members and their families were given the best treatment and complete access to medicine, while the normal people, the awam, were forced to buy their own medicine from the black market. Word of mouth spread about her secret hospital. “Some people started coming from the other side of Mosul, and whatever medicine I had was running out,” she said. “I knew there was plenty of medicine in our hospital, but the storage rooms were controlled by Isis. When Wassan’s hospital was appropriated by Isis fighters [this was a common IS tactic – see the image below and the Human Rights Watch report here; the hospital was later virtually destroyed by US air strikes] her secret house-hospital proved essential. More than a dozen births were performed on her dining table; she kicked both brothers out of their rooms to convert them into operating theatres; her mother, an elderly nurse, became her assistant. 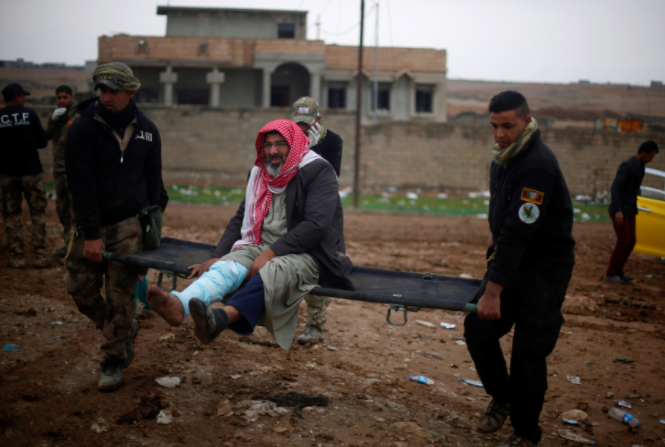 As the siege of Mosul by the Iraqi Army ground on, some of the sick and injured managed to run (or stumble) the gauntlet to find medical aid in rudimentary field hospitals beyond the faltering grip of IS, while others managed to make it to major trauma centres like West Irbil. But for many in Mosul Wassan’s secret hospital was a lifeline (for a parallel story about another woman doctor running a secret clinic under the noses of IS, see here). For Wassan, the ending of Isis rule in Mosul is bittersweet. After many attempts to reach Baghdad to write her board exams for medical school, she was told her work in the hospital for the past three years did not count as “active service”, and she was disqualified. “The ministry said they won’t give me security clearance because I had worked under Isis administration,” she said. This, too, is one of the modalities of later modern war – the weaponisation of health care, through selectively withdrawing it from some sections of the population while privileging the access and quality for others. 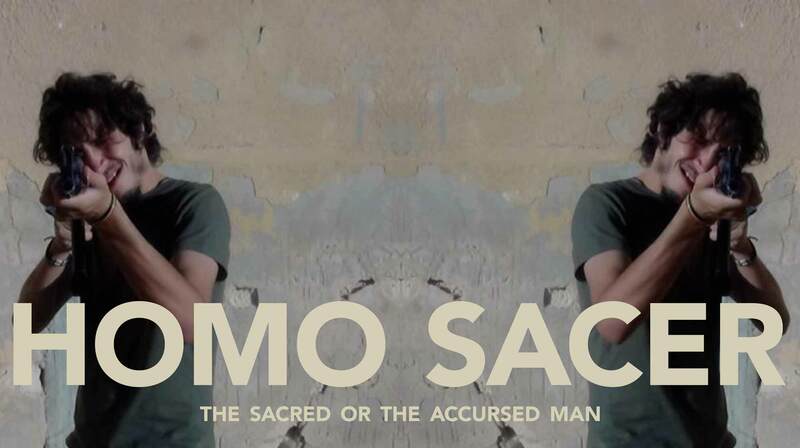 ‘Health care,’ writes Omar Dewachi, ‘has become not only a target but also a tactic of war.’ (If you want to know more about the faltering provision of healthcare and the fractured social fabric of life in post-IS Mosul, I recommend an interactive report from Michael Bachelard and Kate Geraghty under the bleak but accurate title ‘The war has just started‘). 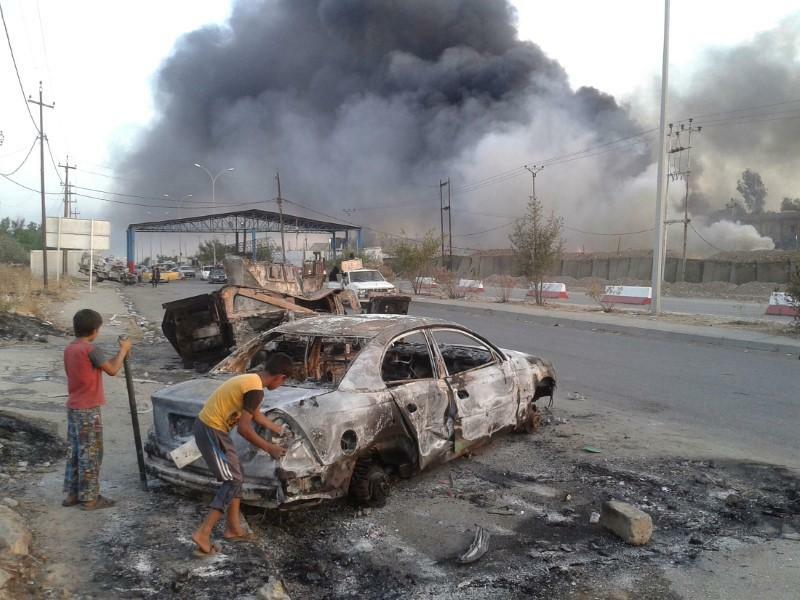 ‘In Baghdad these days, not even the hospitals are safe. In growing numbers, sick and wounded Sunnis have been abducted from public hospitals operated by Iraq’s Shiite-run Health Ministry and later killed, according to patients, families of victims, doctors and government officials. 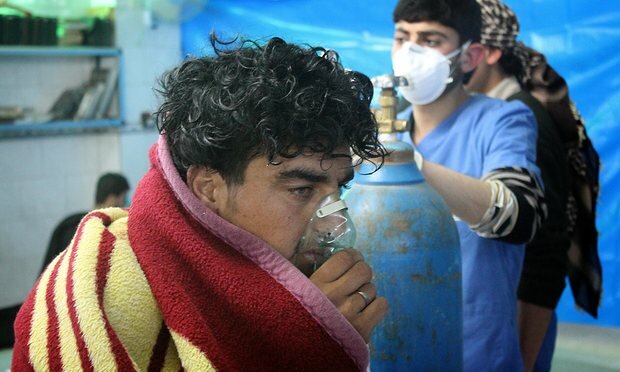 He described hospitals as ‘Iraq’s new killing fields’, but in Syria the weaponisation of health care has been radicalised and explicitly authorized by the state. Is it because the city is something we’ve made together, a collective construction across time and space? Is it because at the heart of the city are commerce and the civic, not war? In The Culture of Cities, published just one year before the Second World War broke out, Mumford included ‘A brief outline of hell’ in which he turned the Angelus towards the future to confront the terrible prospect of total war. Raging against what he called the ‘war-ceremonies’ staged in the ‘imperial metropolis’ (‘from Washington to Tokyo, from Berlin to Rome’: where was London, I wonder? Moscow? ), Mumford fastened on the anticipatory dread of air war. The city was no longer the place where (so he claimed) security triumphed over predation, and he saw in advance of war not peace but another version of war. Thus the rehearsals for defence (the gas-masks, the shelters, the drills) were ‘the materialization of a skillfully evoked nightmare’ in which fear consumed the ideal of a civilized, cultivated life before the first bombs fell. The ‘war-metropolis’, he concluded, was a ‘non-city’. I’m not saying that we can accept Mumford without qualification, still less extrapolate his claims into our own present, but I do think his principled arc, at once historical and geographical, is immensely important. In now confronting what Stephen Graham calls ‘the new military urbanism’ we need to recover its genealogy — to interrogate the claims to novelty registered by both its proponents and its critics — as a way of illuminating the historical geography of our own present. It’s about more than aerial violence – though that is one of the signature modalities of modern war – and we surely need to register the heterogeneity and hybridity of contemporary conflicts. But we also need to recognise that they are often not only wars in cities but also wars on cities. American military planners go to great lengths to distinguish today’s precision strikes from the air raids of earlier wars, which were carried out with little or no regard for civilian casualties. They describe a target-selection process grounded in meticulously gathered intelligence, technological wizardry, carefully designed bureaucratic hurdles and extraordinary restraint. 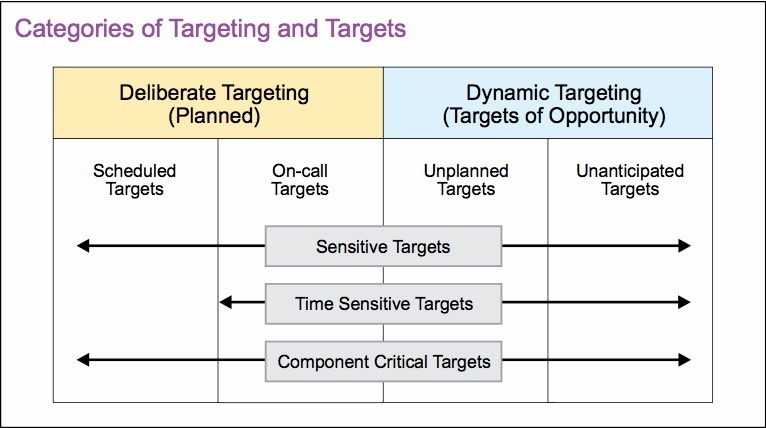 Intelligence analysts pass along proposed targets to “targeteers,” who study 3-D computer models as they calibrate the angle of attack. A team of lawyers evaluates the plan, and — if all goes well — the process concludes with a strike so precise that it can, in some cases, destroy a room full of enemy fighters and leave the rest of the house intact. The coalition usually announces an airstrike within a few days of its completion. It also publishes a monthly report assessing allegations of civilian casualties. Those it deems credible are generally explained as unavoidable accidents — a civilian vehicle drives into the target area moments after a bomb is dropped, for example. 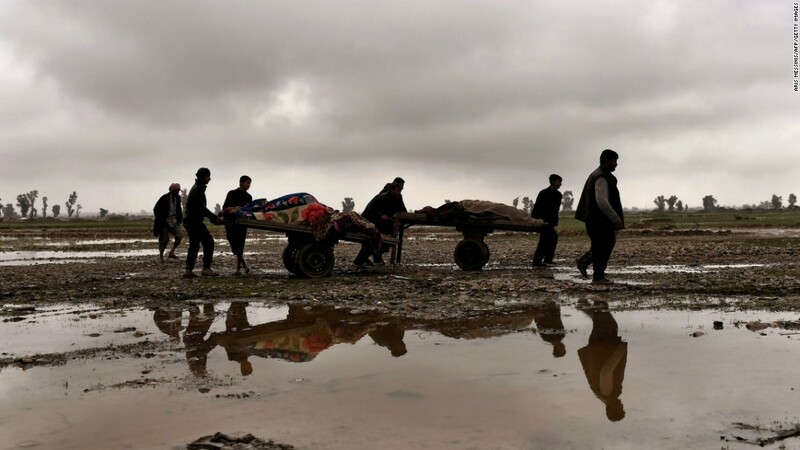 The coalition reports that since August 2014, it has killed tens of thousands of ISIS fighters and, according to our tally of its monthly summaries, 466 civilians in Iraq. 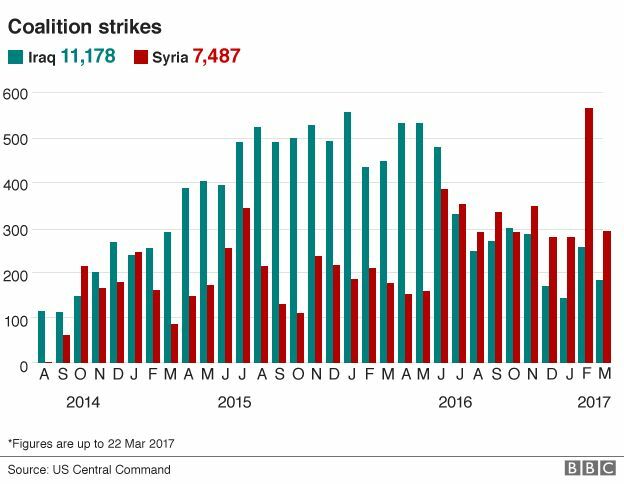 Our own reporting, conducted over 18 months, shows that the air war has been significantly less precise than the coalition claims. Between April 2016 and June 2017, we visited the sites of nearly 150 airstrikes across northern Iraq, not long after ISIS was evicted from them. We toured the wreckage; we interviewed hundreds of witnesses, survivors, family members, intelligence informants and local officials; we photographed bomb fragments, scoured local news sources, identified ISIS targets in the vicinity and mapped the destruction through satellite imagery. We also visited the American air base in Qatar where the coalition directs the air campaign. There, we were given access to the main operations floor and interviewed senior commanders, intelligence officials, legal advisers and civilian-casualty assessment experts. We provided their analysts with the coordinates and date ranges of every airstrike — 103 in all — in three ISIS-controlled areas and examined their responses. The result is the first systematic, ground-based sample of airstrikes in Iraq since this latest military action began in 2014. We found that one in five of the coalition strikes we identified resulted in civilian death, a rate more than 31 times that acknowledged by the coalition. It is at such a distance from official claims that, in terms of civilian deaths, this may be the least transparent war in recent American history [my emphasis]. Our reporting, moreover, revealed a consistent failure by the coalition to investigate claims properly or to keep records that make it possible to investigate the claims at all. While some of the civilian deaths we documented were a result of proximity to a legitimate ISIS target, many others appear to be the result simply of flawed or outdated intelligence that conflated civilians with combatants. In this system, Iraqis are considered guilty until proved innocent. Those who survive the strikes … remain marked as possible ISIS sympathizers, with no discernible path to clear their names. The process seemed staggeringly complex — the wall-to-wall monitors, the soup of acronyms, the army of lawyers — but the impressively choreographed operation was designed to answer two basic questions about each proposed strike: Is the proposed target actually ISIS? And will attacking this ISIS target harm civilians in the vicinity? As we sat around a long conference table, the officers explained how this works in the best-case scenario, when the coalition has weeks or months to consider a target. Intelligence streams in from partner forces, informants on the ground, electronic surveillance and drone footage. 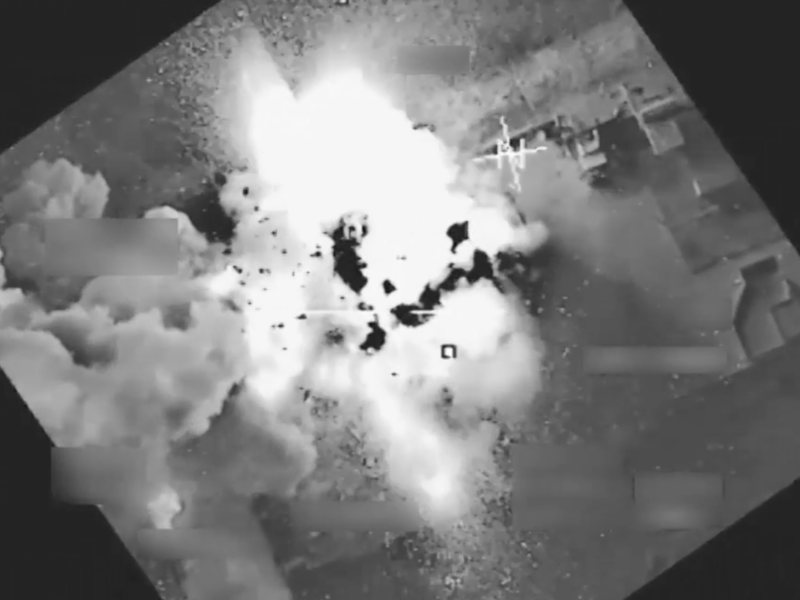 Once the coalition decides a target is ISIS, analysts study the probability that striking it will kill civilians in the vicinity, often by poring over drone footage of patterns of civilian activity. The greater the likelihood of civilian harm, the more mitigating measures the coalition takes. If the target is near an office building, the attack might be rescheduled for nighttime. If the area is crowded, the coalition might adjust its weaponry to limit the blast radius. Sometimes aircraft will even fire a warning shot, allowing people to escape targeted facilities before the strike. 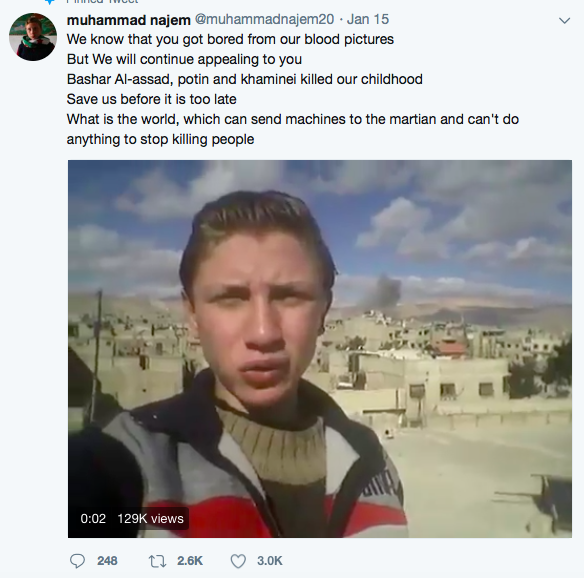 An official showed us grainy night-vision footage of this technique in action: Warning shots hit the ground near a shed in Deir al-Zour, Syria, prompting a pair of white silhouettes to flee, one tripping and picking himself back up, as the cross hairs follow. 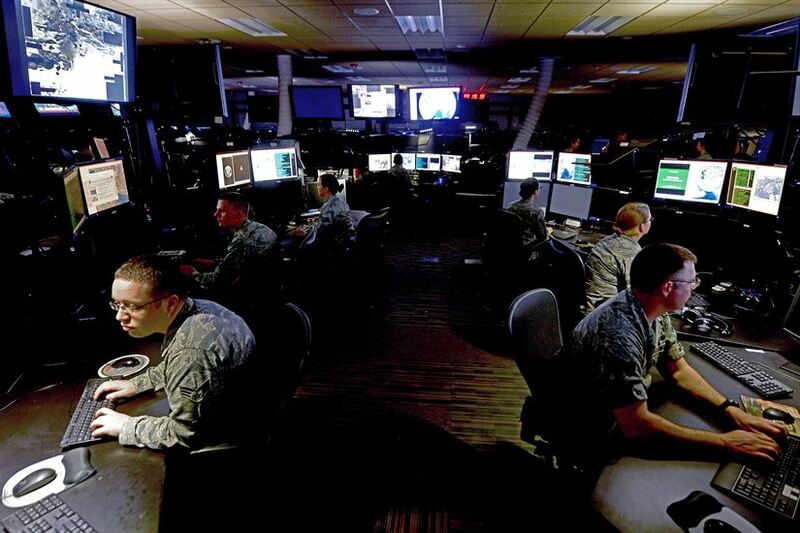 Once the targeting team establishes the risks, a commander must approve the strike, taking care to ensure that the potential civilian harm is not “excessive relative to the expected military advantage gained,” as Lt. Col. Matthew King, the center’s deputy legal adviser, explained. After the bombs drop, the pilots and other officials evaluate the strike. Sometimes a civilian vehicle can suddenly appear in the video feed moments before impact. Or, through studying footage of the aftermath, they might detect signs of a civilian presence. Either way, such a report triggers an internal assessment in which the coalition determines, through a review of imagery and testimony from mission personnel, whether the civilian casualty report is credible. If so, the coalition makes refinements to avoid future civilian casualties, they told us, a process that might include reconsidering some bit of intelligence or identifying a flaw in the decision-making process. 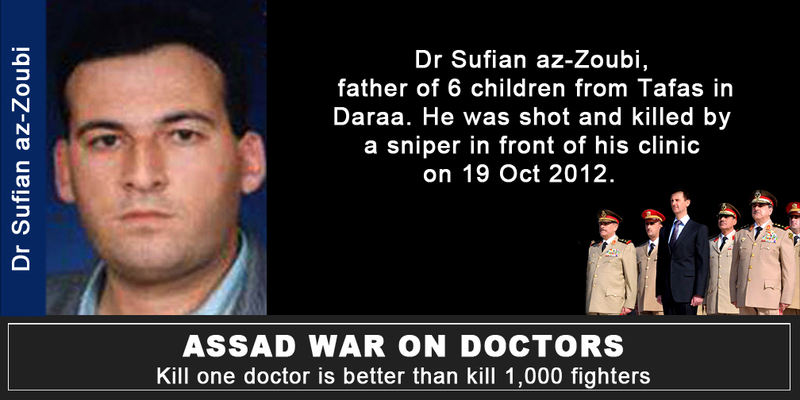 Supreme precision can reduce civilian casualties to a very small number, but that number will never reach zero. They speak of every one of the acknowledged deaths as tragic but utterly unavoidable. Part of the problem, I suspect, is that whenever there is an investigation into reports of civilian casualties that may have been caused by US military operations it must be independent of all other investigations and can make no reference to them in its findings; in other words, as I’ve noted elsewhere, there is no ‘case law’: bizarre but apparently true. But that is only part of the problem. 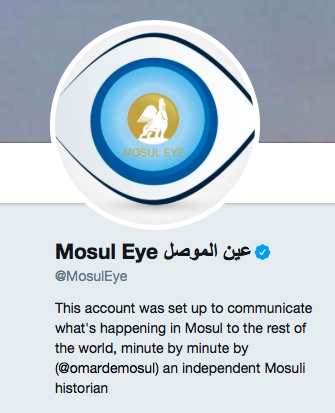 The two investigators cite multiple intelligence errors (‘In about half of the strikes that killed civilians, we could find no discernible ISIS target nearby. Many of these strikes appear to have been based on poor or outdated intelligence’) and even errors and discrepancies in recording and locating strikes after the event. It’s worth reading bellingcat‘s analysis here, which also investigates the coalition’s geo-locational reporting and notes that the official videos ‘appear only to showcase the precision and efficiency of coalition bombs and missiles, and rarely show people, let alone victims’. The image above, from CNN, is unusual in showing the collection of the bodies of victims of a US air strike in Mosul, this time in March 2017; the target was a building from which two snipers were firing; more than 100 civilians sheltering there were killed. The executive summary of the subsequent investigation is here – ‘The Target Engagement Authority (TEA) was unaware of and could not have predicted the presence of civilians in the structure prior to the engagement’ – and report from W.J. Hennigan and Molly Hennessy-Fiske is here. 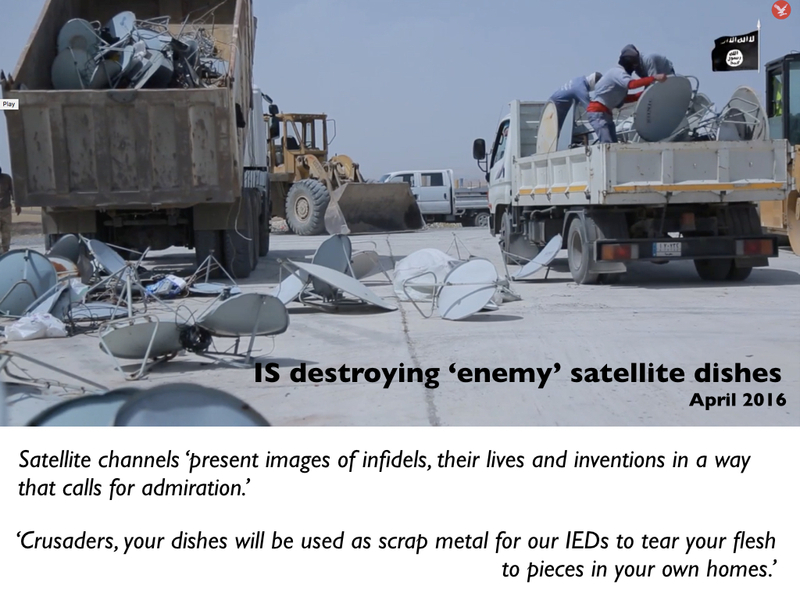 Was this really a “VBIED network”? 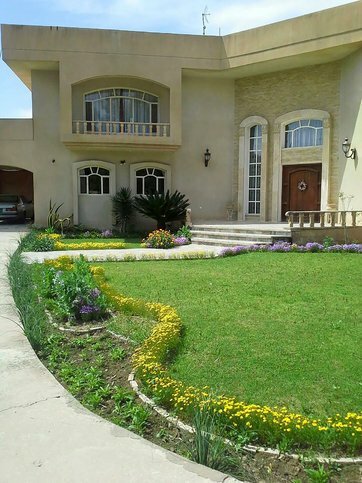 Under the original upload, a commenter starting posting that the houses shown were his family’s residence in Mosul. Days after the strike, Dr Zareena Grewal, a relative living in the US wrote in the New York Times that four family members had died in the strike. 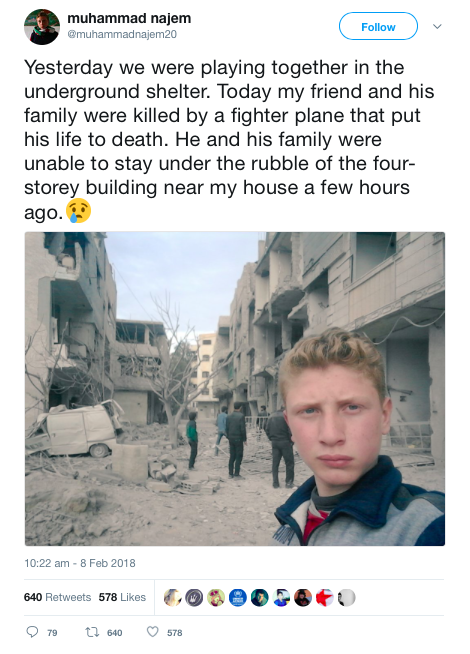 On April 2, 2017 – 588 days later – the Coalition finally admitted that it indeed bombed a family home which they confused for an IS headquarters and VBIED facility. “The case was brought to our attention by the media and we discovered the oversight, relooked [at] the case based on the information provided by the journalist and family, which confirmed the 2015 assessment,” Colonel Joe Scrocca, Director of Public Affairs for the Coalition, told Airwars. Even though the published strike video actually depicted the killing of a family, it remained – wrongly captioned – on the official Coalition YouTube channel for more than a year. According to the coalition’s available data, 89 of its more than 14,000 airstrikes in Iraq have resulted in civilian deaths, or about one of every 157 strikes. The rate we found on the ground — one out of every five — is 31 times as high. 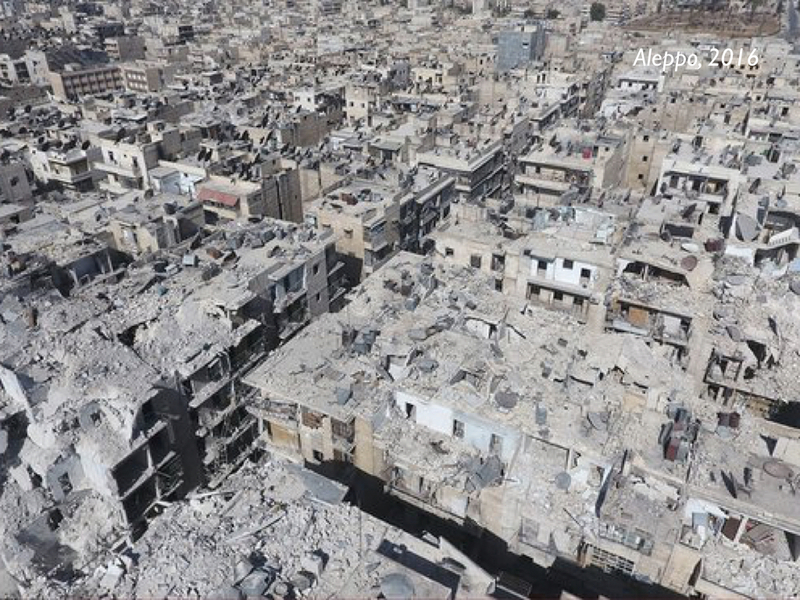 One of the houses [shown above] mistakenly identified as a ‘VBIED facility’ in that video belonged to Basim Razzo, and he became a key informant in Azmat and Anand’s investigation; he was subsequently interviewed by Amy Goodman: the transcript is here. She also interviewed Azmat and Anand: that transcript is here. In the course of the conversation Anand makes a point that amply and awfully confirms Christiane Wilke‘s suggestion – in relation to air strikes in Afghanistan – that the burden of recognition, of what in international humanitarian law is defined as ‘distinction’, is tacitly being passed from combatant to civilian: that those in the cross-hairs of the US military are required to perform their civilian status to those watching from afar. It goes back to this issue of Iraqis having to prove that they are not ISIS, which is the opposite of what we would think. We would think that the coalition would do the work to find out whether somebody is a member of ISIS or not. Essentially, they assume people are ISIS until proven otherwise. To make matters worse, they have to perform their ‘civilianness’ according to a script recognised and approved by the US military, however misconceived it may be. In the case of one (now iconic) air strike in Afghanistan being an adolescent or adult male, travelling in a group, praying at one of the times prescribed by Islam, and carrying a firearm in a society where that is commonplace was enough for civilians to be judged as hostile by drone crews and attacked from the air with dreadful results (see here and here). This is stunning investigative journalism, but it’s more than that: the two authors are both at Arizona State University, and they have provided one of the finest examples of critical, probing and accessible scholarship I have ever read. 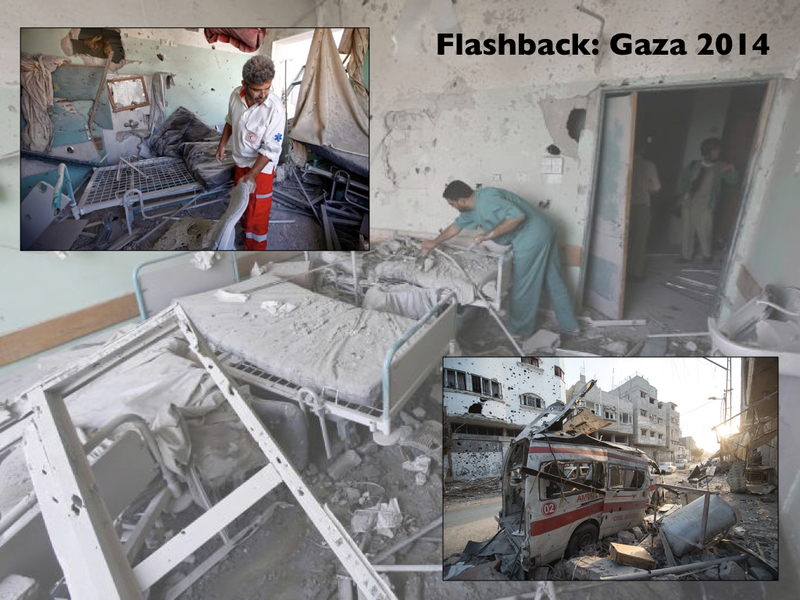 This is the fifth in a new series of posts on military violence against hospitals and medical personnel in conflict zones. It follows directly from my analysis of the situation in Syria here. There are at least four answers to Assad’s disingenuous question (if you falter at the adjective, see here). To be sure, there are other witnesses and even paper trails and photographic records. 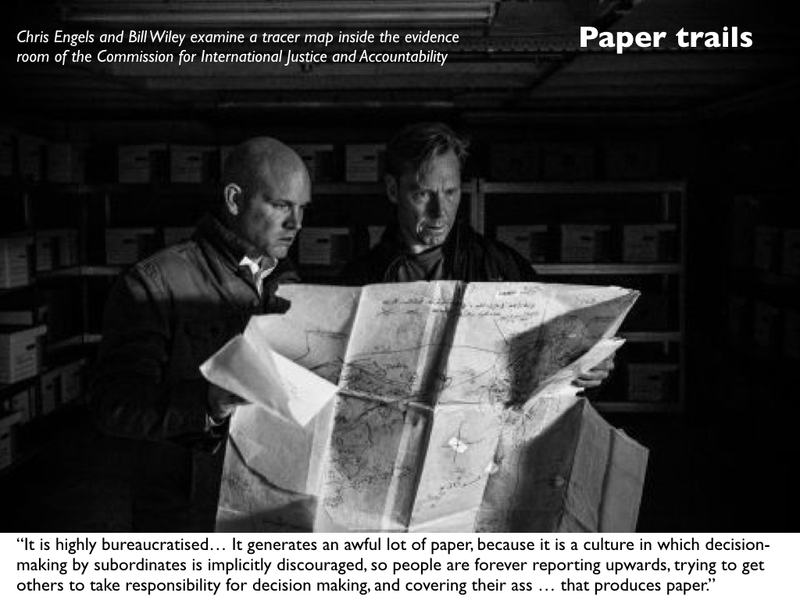 Ben Taub, who has done so much to bring ‘Syria’s war on doctors‘ to the attention of a wider public, has also provided a detailed account of the work done by Bill Wiley and the Commission for International Justice and Accountability whose volunteers have smuggled over 600,000 documents out of Syria detailing mass torture and killings by the regime. This is a radicalisation of an old strategy. As Sam Weber pointed out in Targets of opportunity (2005), ‘every target is inscribed in a network or chain of events that inevitably exceeds the opportunity that can be seized or the horizon that can be seen.’ So, for example, when the United States or Israel bombs a power plant it often as not explains that it has been careful to bomb in the small hours when only a skeleton staff was in the building in order to minimise collateral damage. But this begs the question: why bomb the power plant at all? In most instances the degradation of the electricity supply means that it becomes impossible to pump water or treat sewage; refrigerators fail and food perishes; hospitals are forced to use unreliable generators. 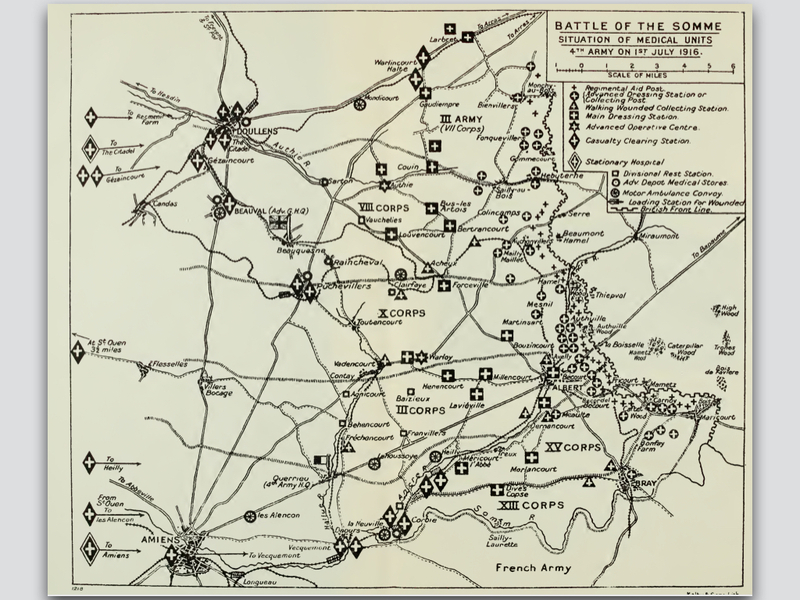 The result – the intended, carefully calculated result – is that casualties rise at considerable distances from the target and over an extended period of time. 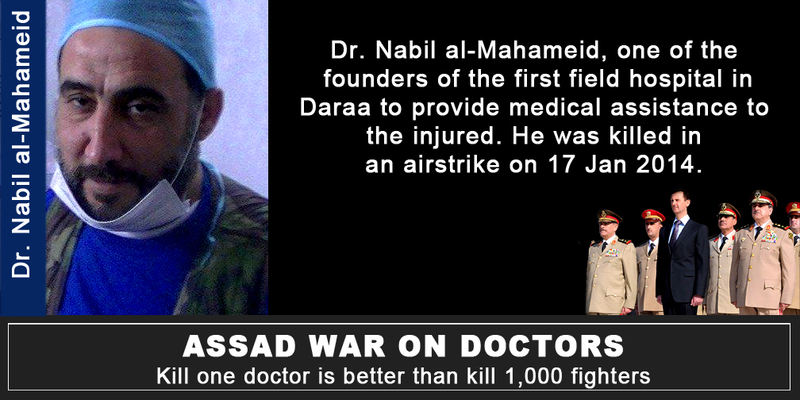 Similarly, Dr Abdulaziz Adel notes: ‘Kill a doctor and you kill thousands.’ Simply put, patients who are sick or injured then go without treatment and in many cases their lives are put at risk. (The images below are from Collateral Damage: more here). This too is an old strategy. The architects of ‘area bombing’ during the combined bomber offensive against Germany during the Second World War described it as ‘moral [sic] bombing’: a sustained and systematic attempt to undermine the morale of the enemy population so that they would demand their leaders sue for peace. If this was a tried and tested strategy, however, the test showed that it was a complete failure (see my ‘Doors into nowhere’: DOWNLOADS tab). 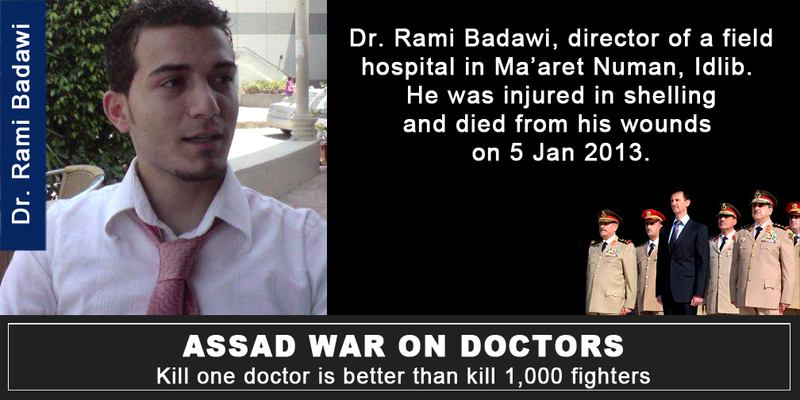 And Syria is not unique in contemporary wars: Israel has deployed the same strategy in its repeated assaults on Gaza (see here, here and here for ‘Operation Protective Edge’ in 2014), and the Saudi-led coalition has attacked more than 70 hospitals and health facilities in Yemen since March 2015 (in this latter case Russian media have reported MSF’s objections to the ‘utter disregard for civilian life’ without dissent: see for example here). ‘Preventing medicine’, as Annie Sparrow puts it, has become ‘a new weapon of mass destruction’. 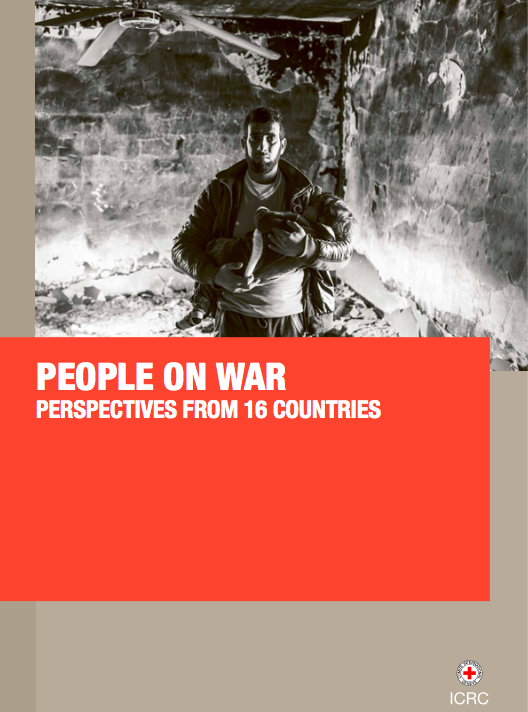 ‘Deliberate attacks on humanitarian workers and civilians are war crimes. This must mark a turning point: the UN Security Council cannot allow increasingly brazen violations of international humanitarian law to continue with impunity. ‘Heads of state are gathered in New York this week for the United Nations General Assembly. Each one that accepts a lack of accountability for perpetrators and facilitators of war crimes colludes in the ongoing dissolution of international humanitarian law’ (my emphases). Nowhere has the supposed deterrent of eventual justice proved so visibly ineffective as in Syria. Like most countries, Syria signed the Rome Statute, which, according to U.N. rules, means that it is bound by the “obligation not to defeat the object and purpose of the treaty.” But, because Syria never actually ratified the document, the International Criminal Court has no independent authority to investigate or prosecute crimes that take place within Syrian territory. The U.N. Security Council does have the power to refer jurisdiction to the court, but international criminal justice is a relatively new and fragile endeavor, and, to a disturbing extent, its application is contingent on geopolitics. But the sting comes in the second paragraph. As I’ve noted before, international humanitarian law is not a neutral court of appeal, a deus ex machina above the fray, but has always been closely entangled with military violence. In many respects it travels in the baggage train, constantly pulled by the trajectory of the very violence it supposedly seeks to regulate (or facilitate, depending on your point of view). In short, as Eyal Weizman has it, ‘violence legislates‘. And not only there. In the case of the US airstrike on the MSF Trauma Centre in Kunduz in 2015, I’ve suggested that some key Afghan officers and politicians chafed at the protections afforded to wounded Taliban combatants by international humanitarian law. They also alleged that the Trauma Centre had breached its conditional immunity because the Taliban had overrun the hospital and were firing at US and Afghan forces from its precincts. There is no evidence to support that assertion, but it is an increasingly familiar claim. 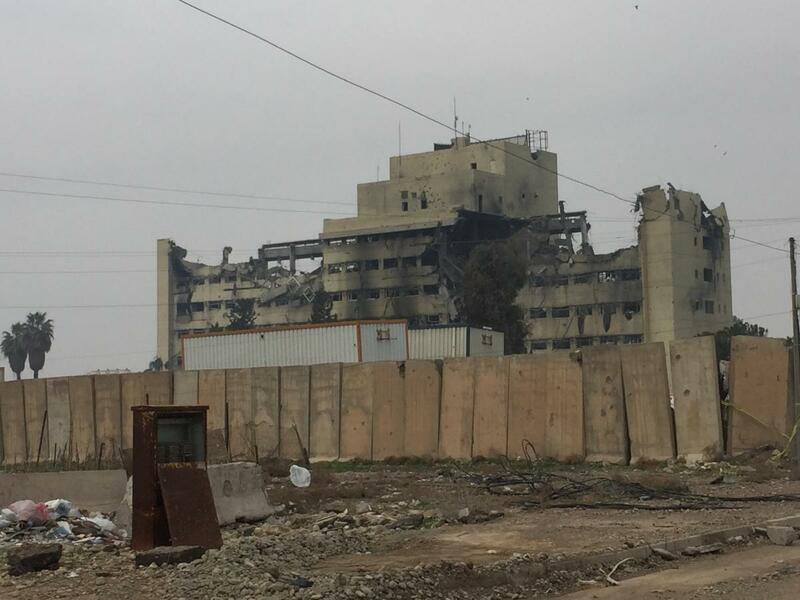 On 7 December 2016 US Central Command justified a ‘precision strike’ requested by Iraqi forces on a building within the al-Salem hospital complex in Mosul by claiming that IS fighters had used it as a base to launch heavy and sustained machine-gun and rocket-propelled grenade attacks. That would certainly have compromised the hospital’s immunity, but international humanitarian law still requires a warning to be issued before any attack and a proportionality analysis to be conducted; Colonel John Dorrian said that the US Air Force did not ‘have any reason to believe civilians were harmed’ but conceded that it was ‘very difficult to ascertain with full and total fidelity’ whether any medical staff or patients were in the building at the time of the air strike. 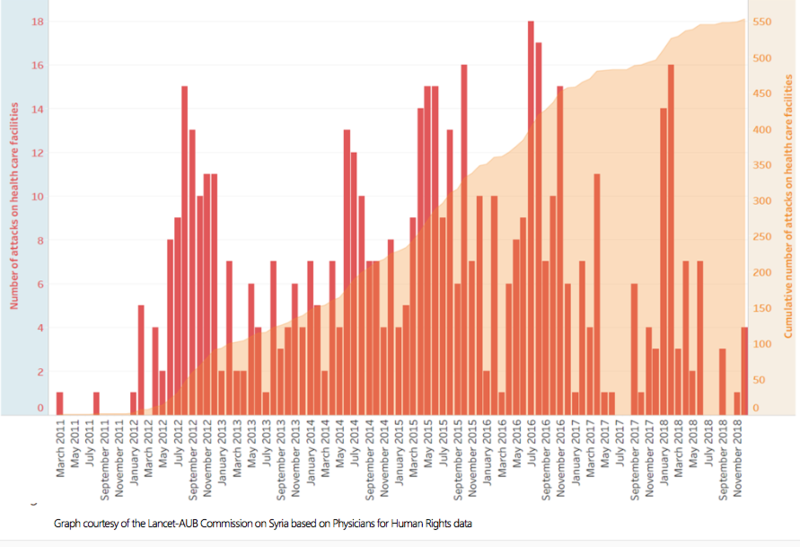 But what the Syrian case suggests is a new impatience with medical neutrality tout court: not only a hostility towards the treatment of wounded and sick combatants but also an unwillingness to extend sanctuary to wounded and sick civilians. Areas in active conflict record greater urgency over questions of civilian protection in wartime than do the great powers that often conduct or participate in those conflicts. In Ukraine, 83% believe everyone wounded and sick during a conflict has a right to health care, compared with 62% of Russians. A full 100% of Yemenis endorse the proposition, as do 81% of Afghans, 66% of Syrians and 42% of Iraqis – compared with 49% of Americans, 53% of Britons, 37% of the Chinese and 67% of the French. So what, then, are we to make of what I’ve been calling ‘the exception to the exception’? I think it’s a mistake to treat ‘the camp’, following Giorgio Agamben‘s vital work, as the exemplary, diagnostic site of the modern space of exception; the killing fields of today’s wars (themselves spaces of indistinction, where it is never clear where war stops and peace begins, where the geometry of the battlefield or, better, ‘battlespace’ becomes ever more fractured and blurred, and where the partitions between international and internal conflicts have been reduced to rubble) are also spaces within which groups of people are deliberately and knowingly exposed to death through the removal of legal protections that would ordinarily be afforded to them. In short, killing and injuring become legally permissible. 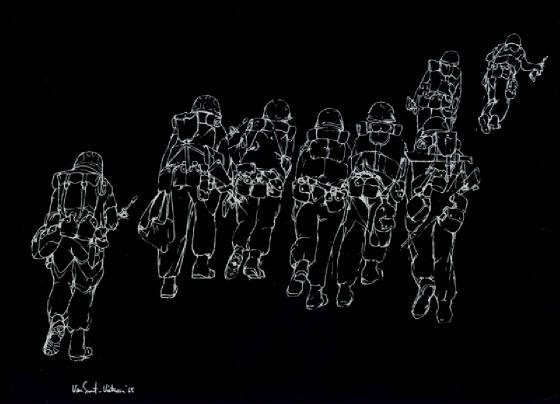 Those exposed groups include both combatants and civilians, but their fate is not determined solely by the suspension of national laws (the case that concerns Agamben) because international humanitarian law continues to afford them some minimal protections. 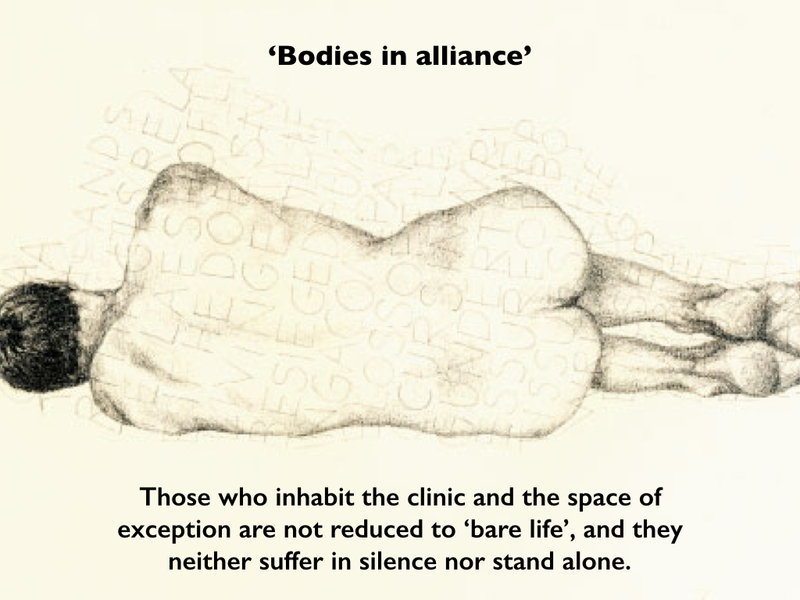 One of its central provisions has been medical neutrality: yet if, through its serial violations in Syria and elsewhere, we are witnessing the slow ‘death of the clinic’ – which I treat as a topological figure which extends from the body of the sick or wounded through the evacuation chain to the hospital itself – and the extinction of ‘the exception to the exception’, the clinic as a (conditionally) sacrosanct space – then I think it’s necessary to add further twists to Agamben’s original conception. As Adia Benton and Sa’ed Ashtan have argued, medical neutrality – the exception to the exception – represents a fraught attempt to restrict the state’s recourse to military violence: it is a limitation on and has now perhaps become even an affront to sovereign power and the state’s insistence that it is ‘the sole arbiter of who can live and who can die’. 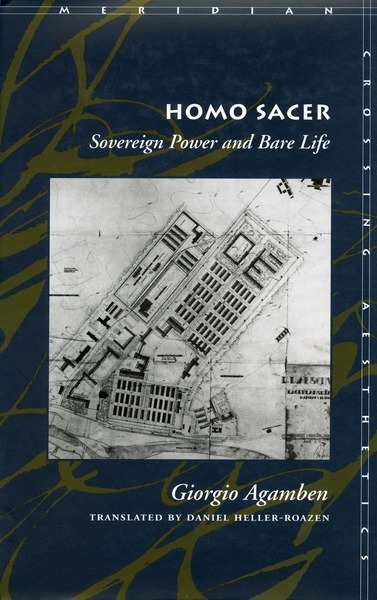 Agamben describes the inhabitants of the space of exception as so many homines sacri – where sacer has the double meaning of both ‘sacred’ and ‘accursed’ – and it may be that in today’s killing fields doctors, nurses and healthcare workers are being transformed into new versions of homo sacer: once ‘sacred’ for their selfless devotion to saving lives, they are now ‘accursed’ for their principled dedication to medical neutrality. Yet the precarity of their existence under conditions of detention and torture, siege and airstrike, has not reduced them to what Agamben calls ‘bare life’. They care – desperately – whether they live or die; they have improvised a series of survival strategies; they have not been silent in the face of almost unspeakable horror; and they have developed new forms of solidarity, support and sociality.